As all of you regular readers know, our focus here on this website is on metal construction systems. However, on occasion we like to show you some special exceptions to this "rule", such as Erector Brik (see the Model Gallery), and the system in this pictorial, Armator. 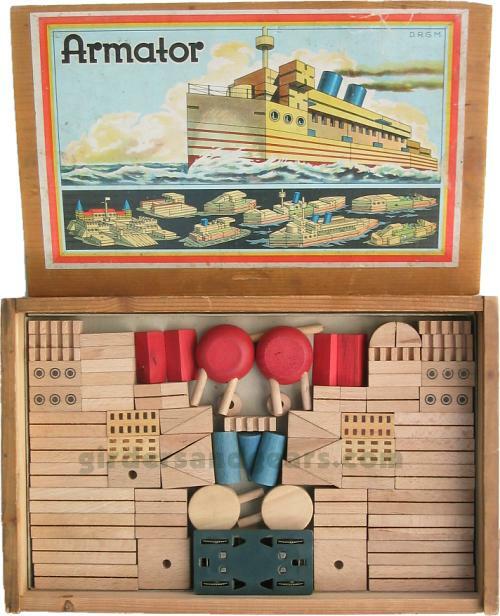 Armator began in Germany in the mid-1920's as a wooden building component system developed by Carl Fritz. The system was composed of an assortment of hardwood blocks - usually beech - of various sizes and geometric shapes. 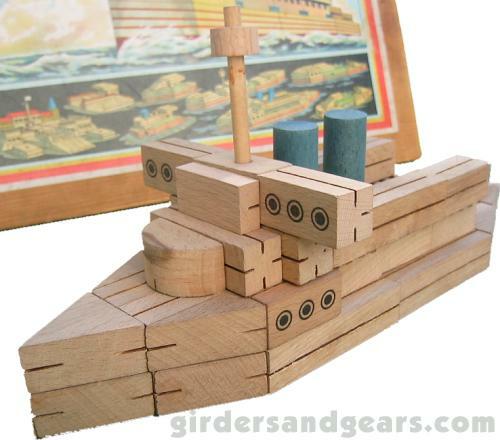 Most of the blocks had a natural finish, but some were stained red or blue, and others had simple details printed on them to represent windows, portholes, etc. 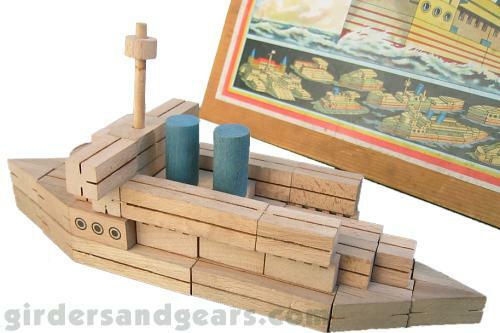 The blocks were packed in cardboard (smaller sets) or wooden (larger sets) boxes which usually featured attractive, colorful labels pasted onto the lids. 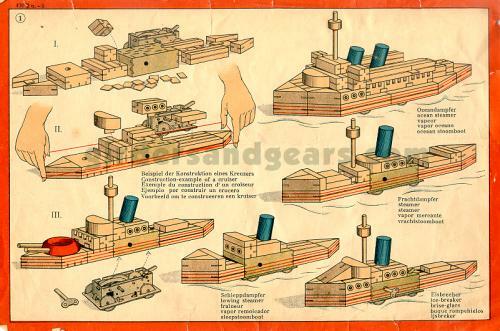 Full color instructions were included for building a variety of models, including castles, bridges, airplanes, boats, trains, and many others. Thus far, Armator probably sounds like most other wooden building block systems. However, Armator had a special feature that distinguished it from most other such systems either before or since: motorized models! Larger sets included a feature rarely found in similar systems, namely a feather spring (clockwork) wind-up motor (see photos below). The all metal motor assembly featured four toothed wheels and a removable cover. 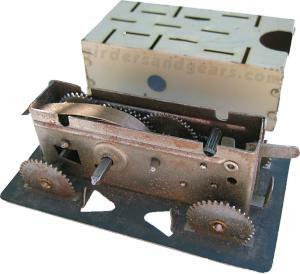 The motor base had a flange around it to support a model and keep it suspended above a surface so that the wheels could roll freely, allowing the model to move under its own power when the motor spring was wound with the included key. Of course, for this to work at all the model has to be able to stay together as a single unit rather than simply being a stack of loose blocks. To accomplish this, the Armator system used a series of thin slits cut into the sides of the rectangular and triangular blocks. Small hardwood splints were pushed into one block, then another block was pushed onto the protuding splint, fixing the blocks tightly together. This system, used in conjunction with thin elastic bands, produced models that held together rather well. A variety of different themed sets were produced over the years. 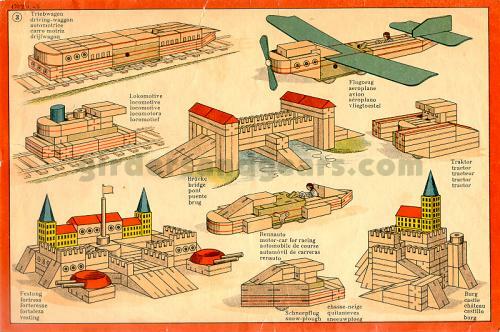 The early 1930's saw sets intended to build cities, locks, airports, etc. 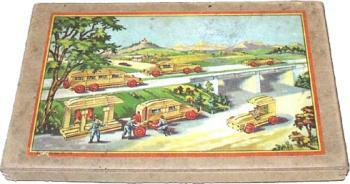 Military sets arrived after 1933, and motorized sets appeared in 1934. 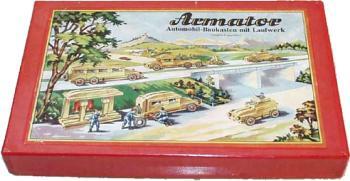 Armator automotive sets (with motor) arrived in 1935, airplane sets in 1940, and still others would come later. 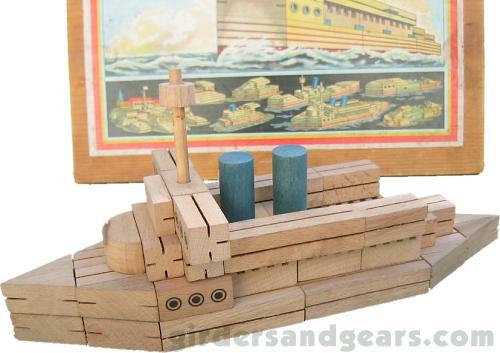 One of the many themed sets that appeared in the 1930's was the motorized Maritime set, shown in the photos below. 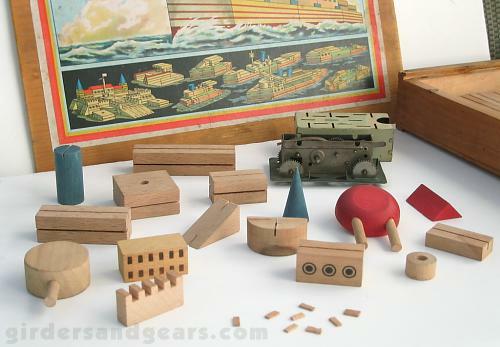 In addition to building a variety of ship models, the set also included parts and instructions for building castles, tanks, race cars, trains, and other models.